The history of original Balsamic Vinegar is very ancient and not everyone knows that the vinegar we usually buy in supermarkets has little to do with the original recipe that follows a long and meticulous process to come to light. The history of original Balsamic Vinegar originates in ancient Rome: known by the Latin name of sapa, it was obtained by bringing grape juice to the boil (other historians place this discovery much earlier in time, around 3000 BC in the Egyptian culture). 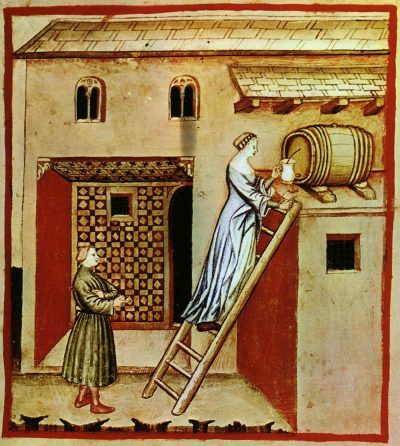 Over the centuries the idea of ​​aging sapa in wooden barrels became popular in the areas of present-day Emilia-Romagna; this is demonstrated by a passage from the 11th century poem “Vita Mathildis” which tells of an Italian prince who brings the precious condiment as a gift to Henry III of France. The popularity of Balsamic Vinegar has grown up over time and in some Renaissance texts it is mentioned with the name “Vinegar of the duke”. The condiment takes the name to which we are accustomed in 1747: in fact, the adjective “balsamic” appears for the first time in an inventory of the noble family of Este. The word comes from Latin balsamum, a term used to describe a beneficial plant: the thing is probably due to the fact that, during the 18th century, Balsamic Vinegar was used to treat the plague; still today many doctors claim that this condiment is a powerful ally in preventing circulation, digestion and diabetes problems. The history of original Balsamic Vinegar goes on to present days: to obtain a bottle of traditional PDO Balsamic Vinegar there are some strict rules and a very precise procedure to follow. Firstly the grapes must necessarily come from vineyards of the provinces of Modena and Reggio Emilia and should be gathered at the end of autumn (the period in which the grapes retain the highest percentage of sugar). After pressing the grapes, the extracted juice should be boiled until it is reduced by half and then kept for years, poured into smaller and smaller wooden barrels, until obtaining a thick and aromatic syrup. After a minimum period of 12 years the Balsamic Vinegar is carefully tested by an official consortium. There are two versions of the traditional Balsamic Vinegar: the “refined” that ages for 12 years and the “extra-old” that ages for 25 years. A bottle of “refined” Balsamic Vinegar can cost between 50 and 100 euros per 100ml of product, while the “extra-old” version can even cost twice as much. The vinegars we find at the supermarket are very different: they often lack the PDO name. There are some brands that offer balsamic vinegar IGP and in this case the origin of the grapes is roughly the same, but the aging process is much less long and accurate. The cheaper versions (non-PGI) include among the ingredients wine vinegar and caramel coloring (E150D) and often have not aged for more than two months. If you want to impress your guests with an aromatic balm with beneficial properties, we suggest you to use Balsamic Vinegar: you will have to spend a few euros more, but the satisfaction will surely compensate for the price.